Thanksgiving is over, Black Friday is over, and Cyber Monday is done. But there’s still around 4 weeks to go before Christmas. Perhaps you want to step up your marketing going into Christmas day or, heaven forbid, start your marketing campaign if you don’t have one yet. So this is your opportunity to join in on the Christmas frenzy and make more sales. 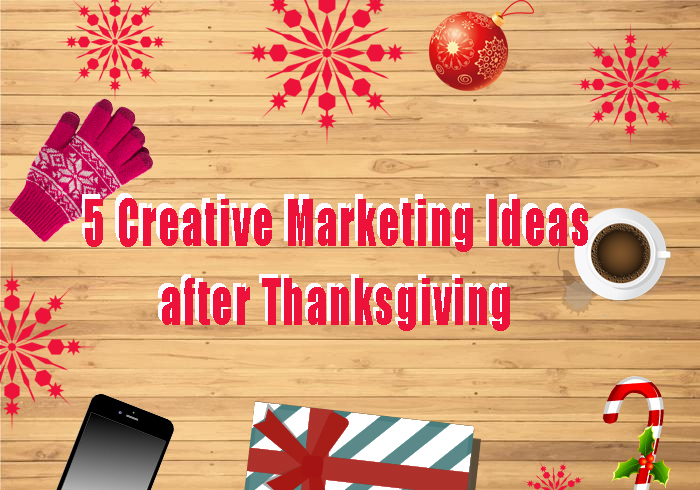 Hopefully, these ‘after Thanksgiving’ marketing ideas can help you drive more traffic and sales to your site. Remember that your best customers are your repeat consumers. So whether you have a loyalty or VIP program, offer all your repeat customers a special exclusive discount on all days leading up to Christmas day. These are your customers that have bought from you repeatedly and therefore are more likely to spread the good word about your brand to others. Treat them with the best discount that isn’t offered to the general populace to make them feel special. You need to offer gift cards as an alternative for people who have a hard time looking for gifts. But don’t just offer any gift cards; printable gift cards will make the gift even more special especially in time for the holidays. Simply offer a free gift certificate template with instructions on how to make the printable gift card. From now until Christmas day and beyond you need to spend more on traditional ads. There’s nothing wrong with spending on banner ads, flyers, brochures, or even a new signage because if you have both a physical and online store, your traditional ads will complement your online digital marketing campaign, and vice versa. More exposure means more sales. Customers always love anticipating new products and looking them over. You can add new products by spreading them out each day up until a few days before Christmas. This will make your store look fresh. This will also attract customers to return to your store. You can also add products specifically for weekends and on the last 2 days before Christmas day. Do your sneak peak videos, posts, flyers, and the like maybe 2-3 days before the actual release. An effective marketing idea to make sales even after Christmas day is to announce on the day itself that your sale and promos are extended up to New Years day. In extending your sale and promos, you can draw in more customers after Christmas day who needs to buy for personal needs or for the home, not necessarily for gift giving.